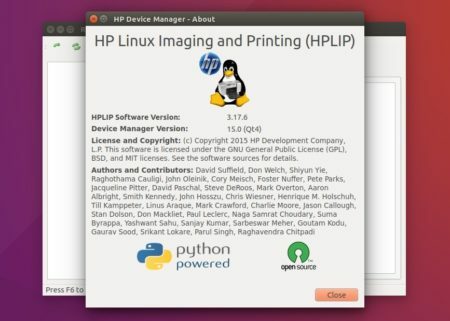 HPLIP, Hewlett-Packard’s Linux imaging and printing software, has reached the 3.17.6 release with lots of new printers support, and Ubuntu 17.04, Debian 8.8 support. HP LaserJet Enterprise M607n, M607dn, M608n, M608dn, M608x, M608dh, M609dn, M609x. HP LaserJet Managed E60055dn, E60065dn, E60065x, E60075dn, E60075x. HP LaserJet Enterprise MFP M631dn, MFP M631z, MFP M632fht, MFP M632h, MFP M633fh. The commands navigate to your Downloads folder, give executable permission, and finally run the installer script in that terminal window. Simply follow the terminal prompts, answer some questions, wait it automatically building HPLIP and setting up your devices, and enjoy.